Global Business Intelligence (BI) and analytics software vendor, Yellowfin, has launched the latest version of its BI platform, Yellowfin 7.2. Note: Yellowfin 7.2 will be generally available and downloadable from Thursday 31st March 2016. 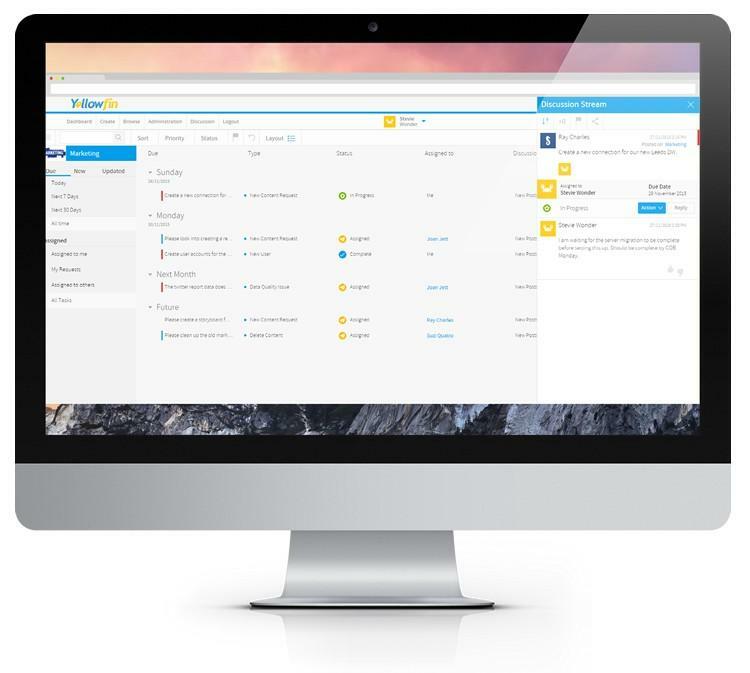 The Yellowfin Business Workflow provides a clear path and process for business users to directly connect with the BI and data experts in their organization, to raise trackable tasks and data quality issues, brainstorm ideas, collectively review content and take better, faster data-driven action. “The BI industry, as a whole, has persistently low user adoption rates,” said Rabie. “In an attempt to combat that issue, many BI vendors have tried to turn business users into data analysts, making them perform self-service data preparation and analysis tasks. At Yellowfin, we think that’s entirely the wrong approach. The industry has been trying to do this for more than 20 years and user adoption rates have remained stagnant at between 12 – 20 percent. “We approach the problem in a completely different way. Yellowfin’s Business Workflow boosts business user adoption by enabling those users to actively participate in the entire data-driven decision-making process. Business users get the BI content they need, without having to turn into overnight BI experts or data analysts. 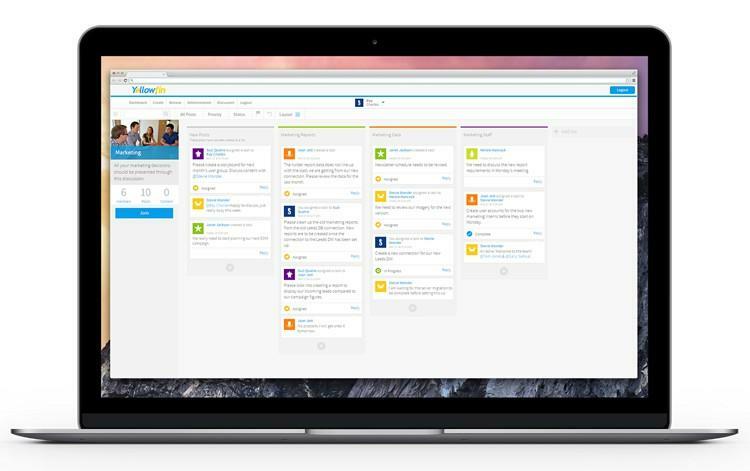 Task Management: Yellowfin’s new Task Management system gives business users the power to raise and assign tasks from anywhere inside the Yellowfin BI platform. Users can flag data quality issues, as well as request, track and review analytic content or analysis before publishing and sharing. Yellowfin’s Task Management system quickly connects business needs with BI experts in the organization, while giving users complete visibility over task progression – from creation through to completion. Discussion Boards: Plan BI projects inside Yellowfin’s BI platform with Kanban style Discussion Boards that allow data analysts and other BI users to brainstorm ideas, organize responses to tasks and manage projects. 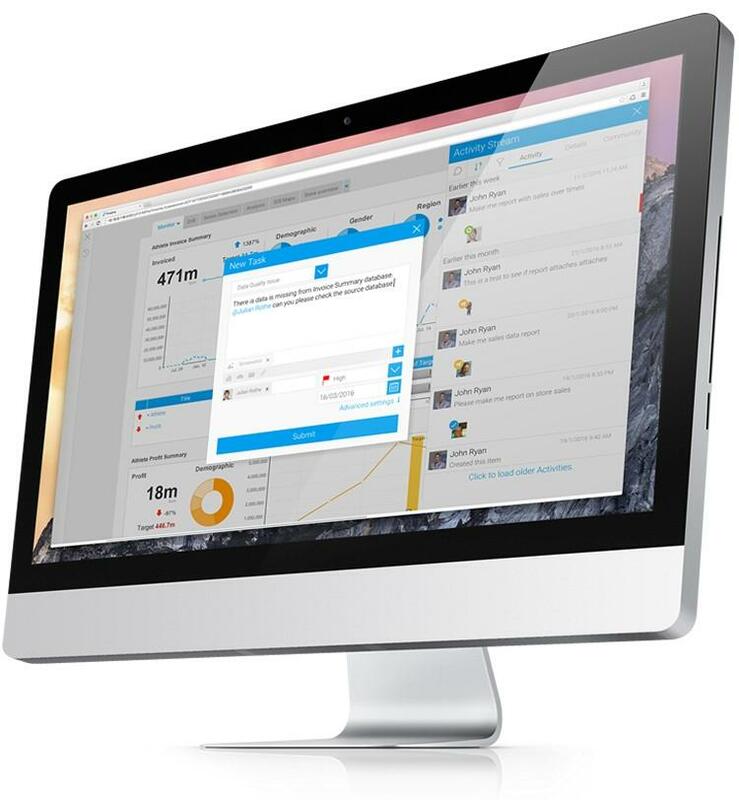 Yellowfin Discussion Boards also enable users to visualize and organize workflow into activity streams to boost transparency, enabling users to easily monitor and communicate progress. Smart Tasks: Yellowfin Smart Tasks improve accountability and instantly turn insight into action by automatically generating tasks from Yellowfin broadcasts. If data falls outside predefined thresholds, a task is instantly created, assigned and given a deadline for completion. Industry expert and Associate Analyst at Bloor Research, David Norris, said that Yellowfin’s collaborative Business Workflow framework addressed an important gap in the BI market. When asked by Yellowfin, Norris said that other BI vendors had approached the challenge of increasing BI adoption differently – by attempting to push the data preparation and analysis responsibilities of the data analyst onto business users – “because it’s easier to adapt what they have to fulfil that goal”. Principal Consultant at international BI consultancy Minerra, Steve Remington, echoed Norris’ sentiments. A recent study conducted by IDC, titled Collaboration in the Age of Big Data, found a “link between the levels of collaboration among IT, line-of-business (LOB) and analytics groups, and the success of Big Data and analytics projects”. There is a clear need to address this lack of communication between BI consumers and BI experts. IDC Program VP of Big Data and Analytics, Dan Vesset, said that the current climate often widened the gap between business users and data analysts, often to the detriment of the enterprise. Yellowfin 7.2 also includes an ‘open’ connector framework, enabling clients to quickly and easily build custom connectors for any third-party Web application. 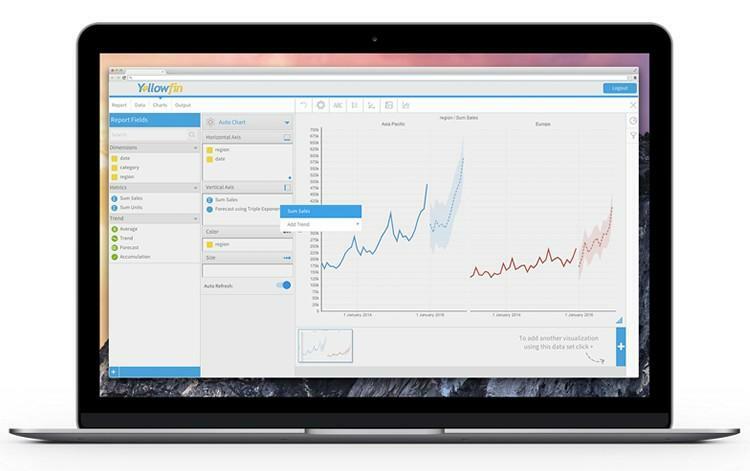 Additionally, Yellowfin 7.2 will ship with a range of API connectors out-of-the-box, including pre-built reports and dashboards, for applications such as Salesforce, Xero, Google Analytics, LinkedIn, Twitter, YouTube and more. 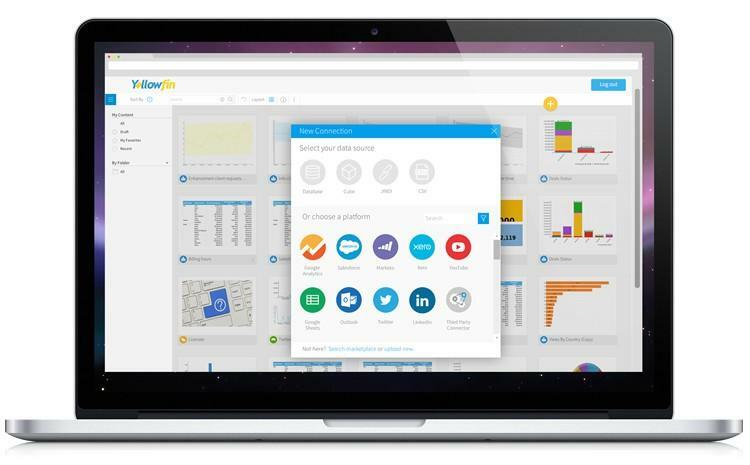 “Yellowfin’s connector framework and pre-built connectors empower users to easily create, share and act on analytical insights from their most important third-party Web apps,” said Rabie. 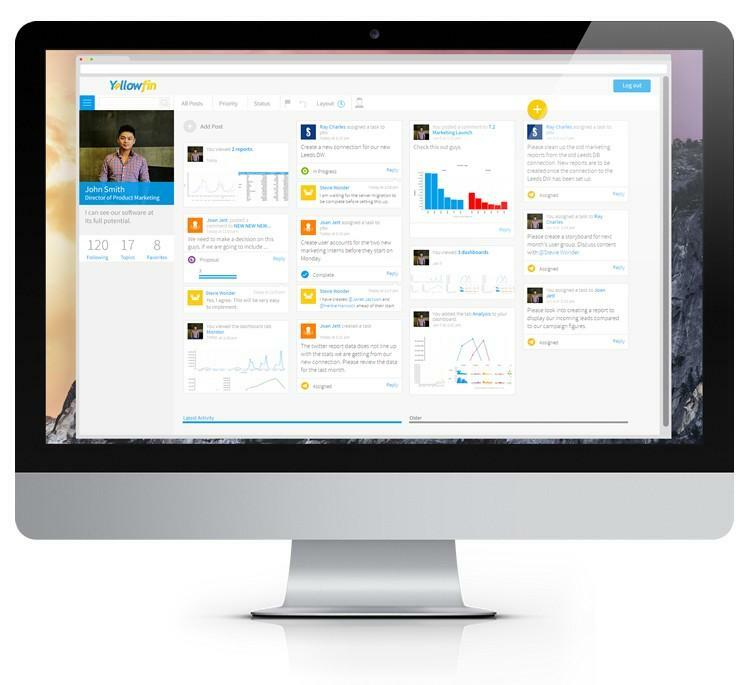 Many of Yellowfin’s out-of-the-box connectors will enable users to analyze data from popular social media applications and marketing platforms. Research indicates that analytics is set to play an increasingly important role in marketing departments and organizations across the globe. New forecasting and trend analysis capabilities in Yellowfin 7.2 extend the breadth of Yellowfin’s analysis capabilities. New forecasting capabilities offer enhanced flexibility, allowing users to set the parameters used to create a model, which enables faster and more accurate forecasting. Changes to trend analysis allow users to easily plot the relationship between two variables on a chart to instantly identify a trend. Finally, users can now automatically plot an average value on a chart by simply selecting to show an average for a particular metric. The ability to conduct predictive analytics is set to become an increasingly important point of competitive advantage, evidenced by projected market growth. Research firm Transparency Market Research has forecast the global predictive analytics software market to grow from USD $2.1 billion in 2012 to over $6.5 billion by 2019 – a Compound Annual Growth Rate (CAGR) of 17.8% from 2013 to 2019. MarketsandMarkets has predicted similarly impressive growth figures, estimating the worldwide predictive analytics market to grow at a CAGR of 25.2% from 2013 to 2018. In fact, MarketsandMarkets forecast the global predictive analytics market to reach $9.2 billion by 2020, at a CAGR of 27.4% during the forecast period. Yellowfin’s clients and partners spoke enthusiastically about how Yellowfin 7.2 would positively impact their businesses. “Yellowfin 7.2 delivers several features that I have always wanted in a BI solution – it’s clear the development team has worked tirelessly. The out-of-the-box API connectors and report content for Web apps – as well as the introduction of Yellowfin’s collaborative Business Workflow – will give Quantiphi and all Yellowfin channel partners a strong competitive edge. “I really appreciate the effort Yellowfin puts into each new release and into making the user interface as user friendly as possible. “I have to say a huge thank you to the team for introducing pre-built connectors and the ability to create our own. I’m absolutely thrilled to have the ability to connect to R. I couldn’t be happier.